Motorcyclists from the Night Wolves, a pro-Kremlin motor club, have already departed for Berlin on their second consecutive “patriotic” rally. However, the bikers, who intend to commemorate victory in WWII, have already been barred from entering Poland. 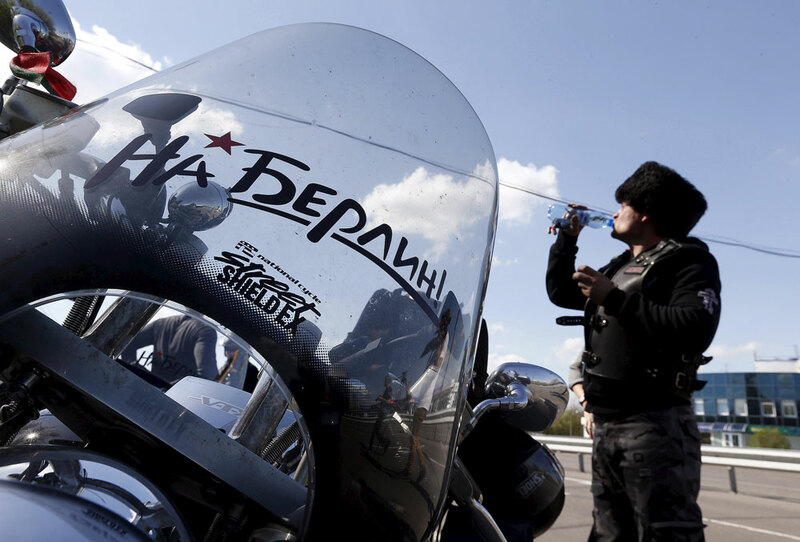 Bikers from the pro-Kremlin Night Wolves motor club caused something of an international scandal in 2015 after embarking on a “patriotic” motor procession to Berlin to commemorate the 70th anniversary of victory over Nazi Germany in 1945. However, despite the failure of many participants to make it to their destination last year due to visa bans by Poland and Germany, the motorcyclistsplan to repeat the rally this year. They left Moscow on April 29 and intend to be in Berlin by May 9 to lay flowers on the Soviet War Memorial. This year the ride is being led by a different "wolf," Andrei Bobrovsky. The Night Wolves motor club president Alexander Zaldostanov (alias The Surgeon) is on the sanctions list and is forbidden from entering the EU. However, the new leader’s hopes that there will be no scandals this year have already been dashed. On April 28 the Polish Interior Ministry informed the Russian embassy in Warsaw that entry to the country would be denied to the motorcyclists. This means the bikers will have to find an alternative route. The idea of riding from Moscow to Berlin in a large procession came to the bikers after hearing the story of veteran NadezhdaKirillova, a Soviet reconnaissance scout who participated in World War Two on her motorcycle. Zaldostanov noted that the Night Wolves had dedicated their ride to her and other veterans. However, many European countries were not particularly fond of the Russian bikers' patriotic display, perhaps because their leader is famous for his personal friendship with Vladimir Putin and his harsh anti-Western statements. Poland and Germany thought the 2015 ride was an act of aggression and did not allow several participants of the "motor march" onto their territory, annulling their visas. In the end far from all the Night Wolves made it to Berlin. According to Bobrovsky, the objective of the "motor march" is to commemorate the Soviet soldiers. If the bikers make it to their destination, they will ride through Berlin with a victory banner and will lay flowers on the Soviet War Memorial in Treptower Park. "This is respect for our common history, which cannot be forgotten and rewritten," explains Bobrovsky, who is convinced that ordinary Europeans, unlike their governments, support the act. "Russian soldiers liberated Europe from Nazism and sensible people remember this." The Night Wolves intend to hold these "motor marches" every year and increase the number of participants. This year the ride expects the participation of friendly bikers from Poland, Slovakia, the Czech Republic and Germany. Zaldostanov thinks that there will be almost 300 motorcycles in the procession, which is significantly more than the several dozen people who reached Berlin last year. The organizers emphasize the memorial nature of the ride, but Russian political analysts believe that it is also designed to provoke people. "Sure, there is a provocative element in the ride," says Alexei Mukhin, general director of the pro-Kremlin Center for Political Information. "This is a sort of message for Germany and Europe." In Mukhin's opinion, the Night Wolves want to remind Germany and other European countries "who actually defeated Nazism," thus trying to win over the public. "Perhaps, by remembering their common history with Russia, Germany and Europe will adopt a more independent policy and not be directed by the U.S.," he said. Valery Solovei, a professor at the Moscow State Institute of International Relationsand a political analyst, also believes the motor ride to Berlin is a provocation, but without any political meaning. In his opinion, the ride by bikers famous for their anti-Western rhetoric could have a negative impact on relations between Russia and Europe. "This act's only aim is to irritate the Western countries. This is a provocation without any political subtext, a move that, in my opinion, is absolutely meaningless," Solovei summed up.